Well, that looks fine to me, if you goal was to depict a Mobius strip. I gather it wasn't, however. That's exactly what it's like! No it wasn't the aim!!! Not even Rust is immune to undefined behaviour. Don't worry! There are enough smiley faces and hearts to solve this. Not really going crazy, and it's actually expected behavior, but crashing nonetheless. 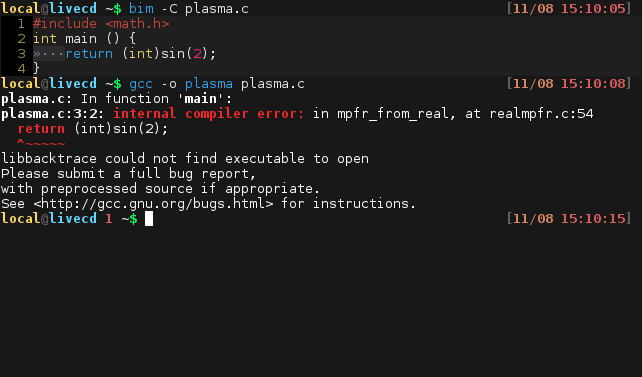 I am currently porting my compiler/VM to my OS to provide a user-mode programming language. Here you can see it come to life. What happened is the VM crashed because of an unimplemented opcode, which resulted in the VM trying to drop its hosting task. 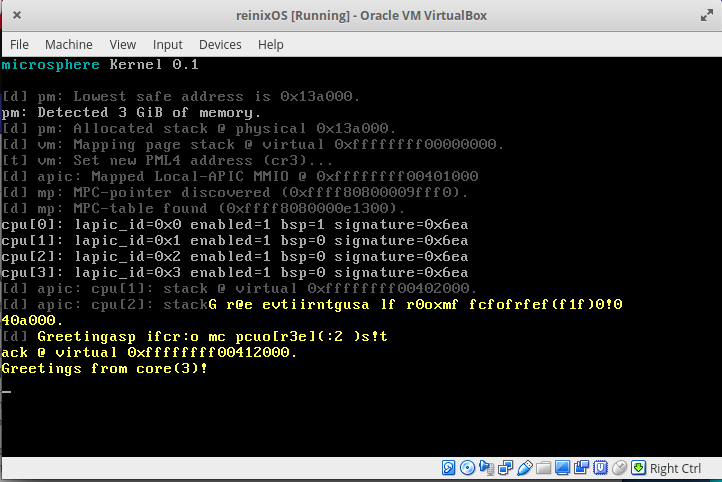 However, my proof-of-concept implementation is running it in the kernel task, which is "immortal" (can't be dropped). 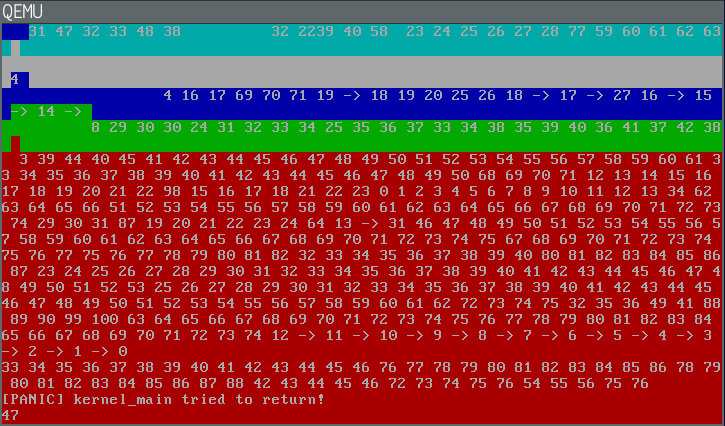 The result is that the CPU continues executing garbage and eventually raises an interrupt. 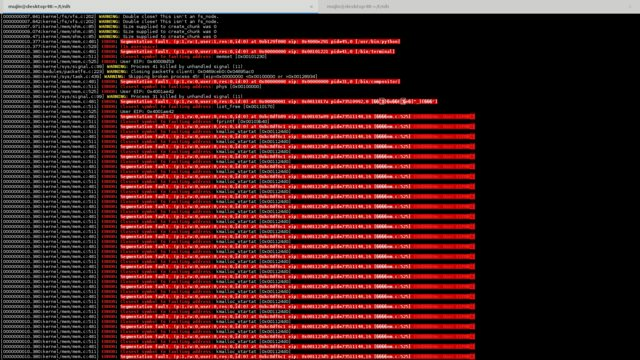 Looks like a pretty standard panic screen right? 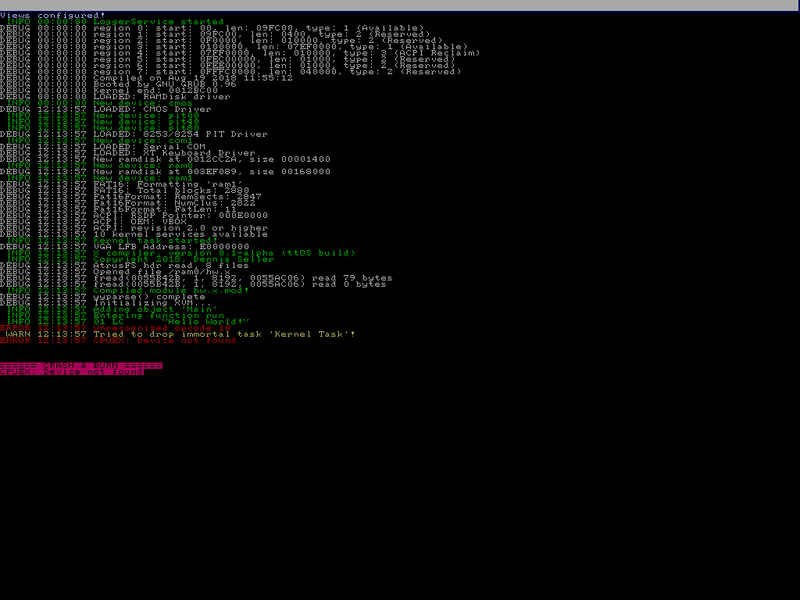 Turns the screen red and print some debug info? The reason that, shall we say, mildly surprised me is that I never programmed it to turn red. 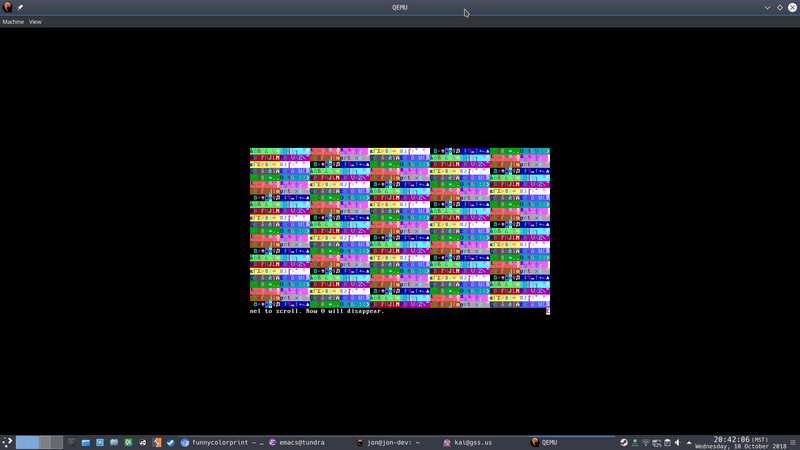 In fact, the whole operating system literally has no code to change the color of the screen! 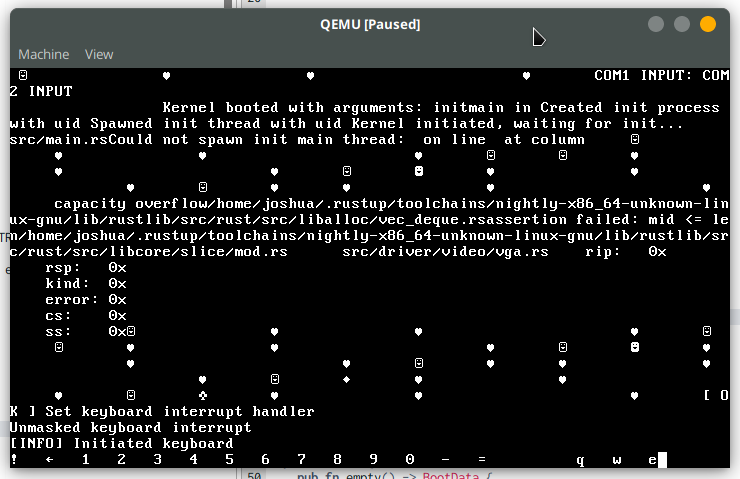 What it turned out to be was that I had screwed up my initial implementation of threading, and was setting the RSP0 value in the TSS to the bottom of the allocated stack region, so the stack was immediately clobbering kernel data. What happened to be right below the stack for the first thread? The default background color applied to all characters printed. 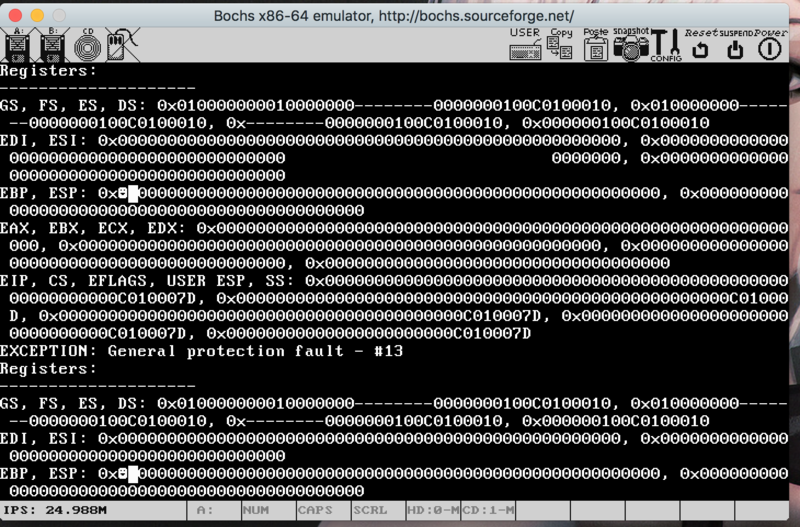 Basically it's just saying "Error: drive has no errors." The maker of Foxtrot microkernels. Currently just Greyhound, which is currently smaller than 3 KiB.